Since 1865, when the Caledonian Railway Company built its line with a ferry terminal, Wemyss Bay has become a well-known and loved railway station, forever linked to sailing across the Clyde, holidays on the beautiful Isle of Bute, fresh air, fun and relaxation. The present station and pier were built just over 100 years ago, in 1903, by the Caledonian Railway Company, doubling the number of platforms and steamer berths of the previous structures. The architect, James Miller, and Donald Matheson, Chief Engineer of the Railway Company, were the men responsible for its design. An Edwardian masterpiece, it was the first of the Clyde railway piers to be built, and is now the last one remaining. It well deserves its Category A architectural listing, with its sinuous, graceful curves, and elegant glass canopies, still protecting passengers coming off the trains and heading down for the boat connection to Rothesay on the beautiful Isle of Bute. 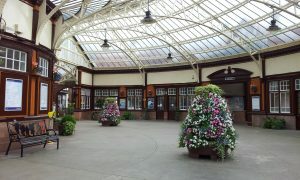 This website is run by Friends of Wemyss Bay Station – a group formed in 2009 by local people who shared concern for the neglected state and appearance of the station, with the aim of reinstating the station’s traditional floral displays. Despite a major programme of repair and restoration in 1994 the station’s canopies and glazed roof leaked like colanders in several places. Several of the rooms around the concourse, formerly waiting rooms, lay empty and forlorn. And the feature for which the station had been famed since it first opened, its displays of potted plants and hanging baskets, were no longer to be seen. A modern railway no longer requires several hands to run it. One man is on duty at a time now, and he has no opportunity to attend to plants. ScotRail operates a programme called ‘Adopt a Station’, aimed principally at unmanned stations, but also available to others. Members of a local community are encouraged to take an interest in the appearance of their station, usually by installing and maintaining containers of plants, for which ScotRail supplies funding. Wemyss Bay and Skelmorlie residents decided to take advantage of this offer, and formed themselves into a named group, “Friends of Wemyss Bay Station”. 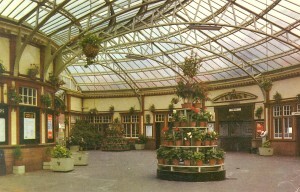 Starting with some tubs of plants, they have gradually expanded their activities both inside and outside the station buildings. Towers recall the tiered displays of the past, and from 2011 to 2013, Inverclyde Council awarded the group prizes for their efforts in their annual GardenFest. In 2013 they won a a silver cup!. A Station Garden has also been created on the remains of a siding which had been an eyesore for many years. This now houses a polytunnel and some raised beds where a variety of vegetables and plants are grown, as well as cuttings and seedlings in preparation for the next season’s Station Display. In the empty First Class Waiting Rooms the Friends now operate a secondhand bookshop and gallery, open 6 days per week, and staffed by volunteers. The funds raised have been used to restore these neglected rooms to something of their former glory. The gallery displays an exhibition of photographs of the history of the station, and the local area, and is used for other exhibitions when required. The rooms have become a place to visit, to spend time when waiting for train and boat, a refuge from the weather, a source of gifts with a local slant.